Granite, marble, and quartz counter tops might be the most sought-after kitchen element, but my heart belongs to butcher block. 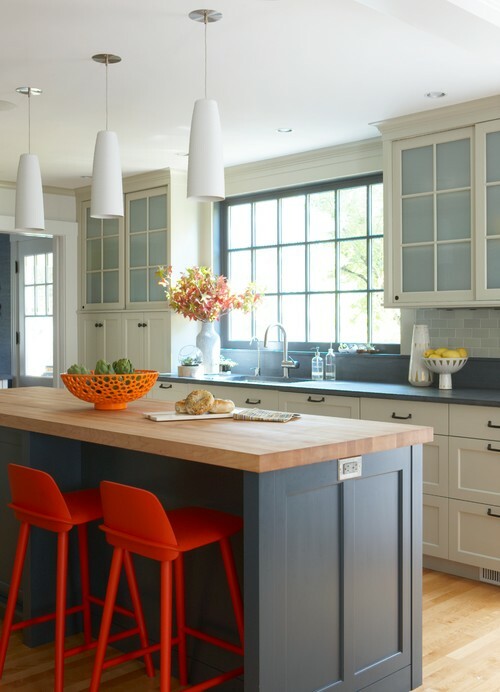 The warmth of the wood, the organic appeal of the grain, and the sturdy functionality are just some of the reasons to install butcher block counter tops. 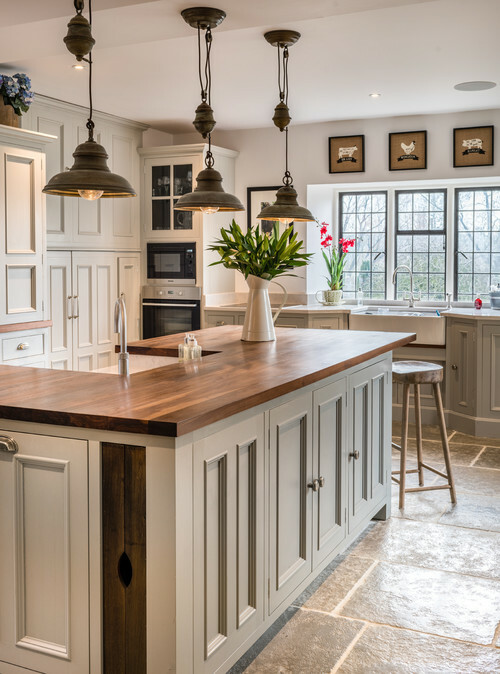 Here’s a roundup of gorgeous kitchens that have incorporated the timeless appeal of wood in the kitchen. 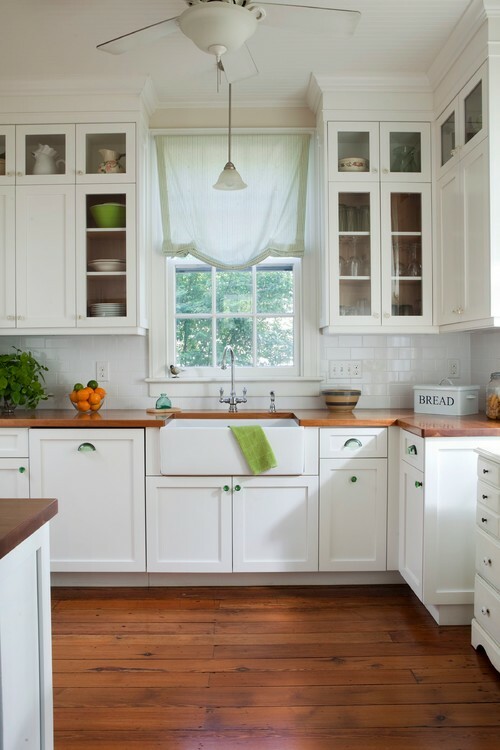 This cream-colored kitchen wears all the ambiance of a down-home kitchen. It’s pretty and functional, and makes you feel like only good food can come out of it. 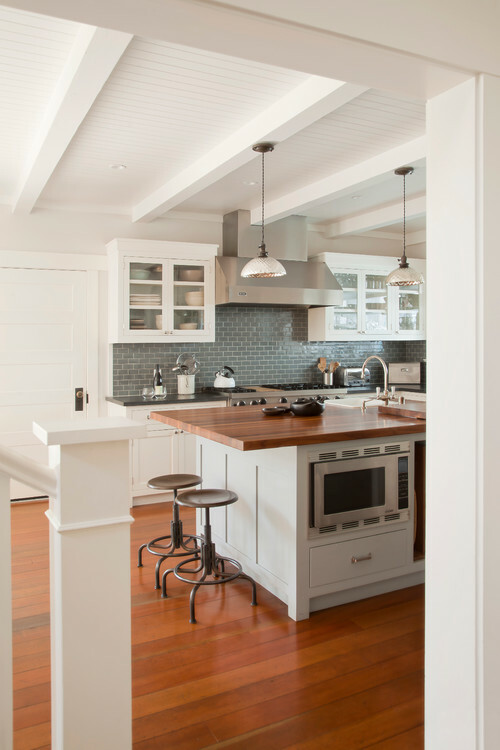 One glance and it’s easy to see that butcher block counter tops look fabulous with wooden kitchen floors underfoot. 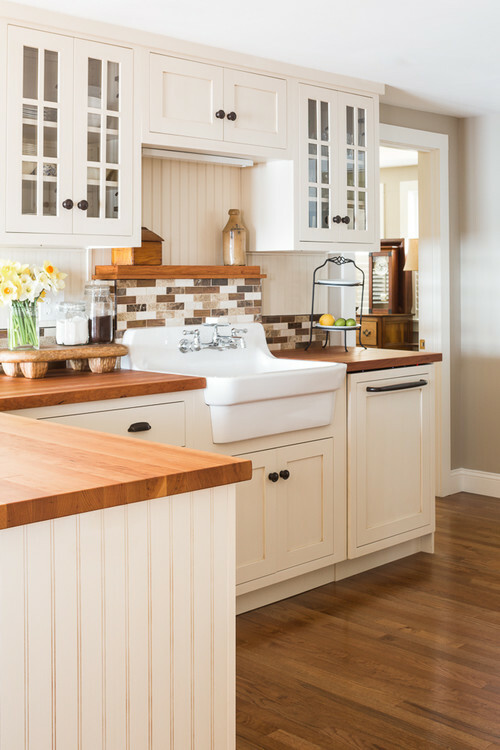 Any white kitchen looks warm and inviting paired with plenty of wood. Butcher block is good at hiding knife marks and proves durable over the years. Butcher block pairs well with other materials like granite and marble. Break up work-top surfaces by using more than one type of counter top material. 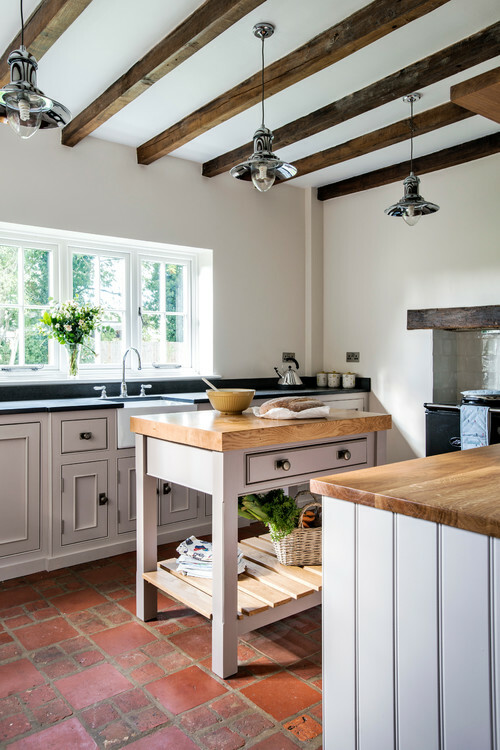 If you’re looking for an earthy, organic type kitchen, butcher block should be your first choice. It looks classic with stone floors. Photo by BNR Interiors, Inc. 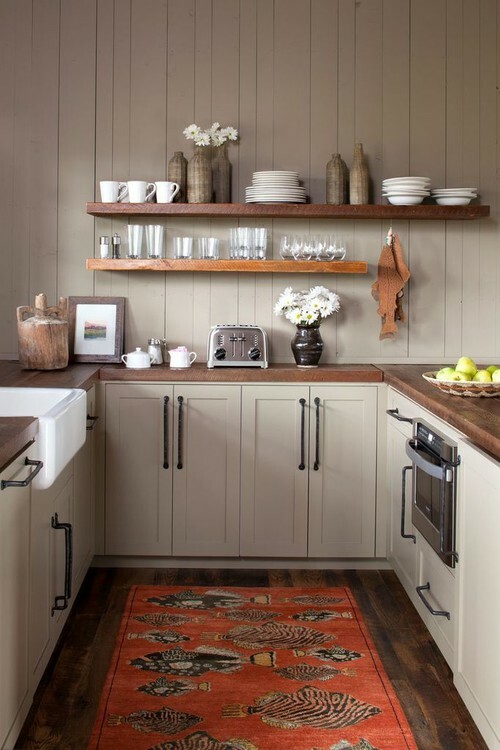 Neutral tones are a classic yet fresh look for kitchens, and wood counters fit right in with rustic appeal. 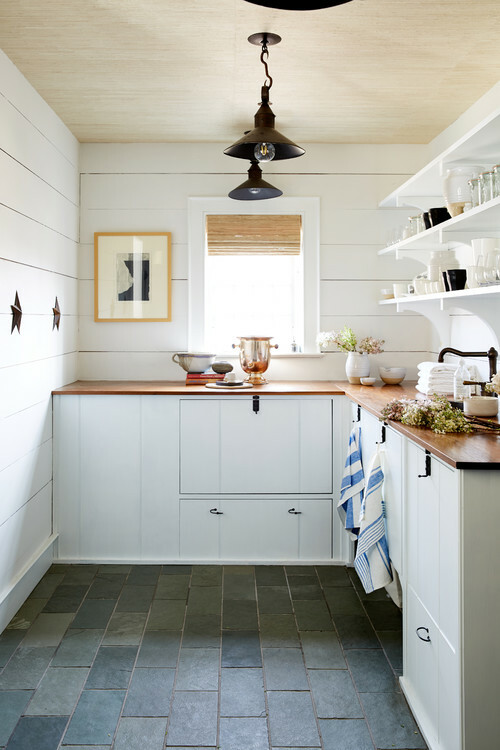 With the resurgence in farmhouse style, I predict that butcher block counter tops are going to grow in popularity. Whenever we get around to installing new kitchen cabinets, I’m opting for the timeless appeal of wood counter tops. I know it’s not for everyone, but I’ve always loved the look! I opted for butcher block and am so glad I did. They bring so much warmth to the room and I just love the timeless look. You’re so lucky to have them, Kathy! I just think they’ll never go out of style and the wood is so pretty! We recently installed dark walnut butcher block to go with the existing white cabinets in our kitchen. Moving from a farm, this gave our kitchen that farmhouse look with so much warmth. We love them so much! Makes all the time spent in the kitchen a lot more fun! We made our own countertops out of rough milled, 12″ wide white oak boards from a nearby lumber mill. We attached them together and hand planed them. Then we finished them with a food safe dark tung oil. They look gorgeous, and cost about $130.00 for the whole kitchen! I really like them! Are they hard to maintain? We find them easy. We treat them with a food safe product called Watco found at Lowes. I recently had a carpenter install ones from IKEA and then I sealed them. It was a lot easier to do than I thought and it looks beautiful. It was also inexpensive, but my kitchen was small. I am a lover of RED!!!! To look at anything red makes me happy. I didn’t plan this, it is just how I am. I have red throughout my home. My kitchen cabinets are red in a 1950’s house, so it is a tiny postage stamp size kitchen. I love it with my cream walls (also using natural wood on the lower part of walls), and floor covering. It works for me!!!!!! Everyone comes says we have a lovely home. I must admit NO ONE screams they love the cabinets. Beauty is in the eyes of the beholder! Do you know a warmer color? Christmas, hearts, etc. all RED. Thanks for sharing the red and cream kitchen. PS I do not wear a lot of red except at Christmas and Valentines. I agree completely and even i ever get to it would love to have them on mine. Love those examples. I have always like butcher block counters. Maybe someday, sigh. A few years ago we refurbished our kitchen using granite counters and recycled glass tiles for the back splash.I now regret not the tiles but the counters. Wish I had used a dark butcher block.